The Atlanta Braves will kick off Monday’s GM meetings by announcing Alex Anthopoulos as their new GM. 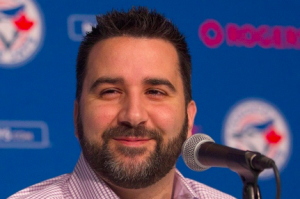 Several sources have confirmed that the Braves have tabbed Anthopoulos to be their new GM. An official announcement is likely to come Monday at the GM meetings. Anthopoulos has served as vice-president of baseball operations for the Los Angeles Dodgers for the past two seasons. Prior to that, he was GM of the Toronto Blue Jays. He will replace former Braves GM John Coppolella, who resigned last month amidst an MLB investigation into Atlanta’s international signing practices. Atlanta’s top choice appeared to be Royals GM Dayton Moore. However, they did not receiver permission from the Royals to speak to Moore. Eventually, they narrowed their search to Anthopoulos and Jim Hendry. They have since decided on Anthopoulos as the GM to lead their team into a new era. Before resigning, Coppolella guided the Braves through an extensive rebuilding process. He built one of the strongest farm systems in baseball and appears to have the Braves in a position to start competing in the NL East. Anthopoulos appears to be tasked with putting the finishing touches on Coppolella’s rebuild. Assuming the Braves become competitive again after four straight losing seasons, Anthopoulos will try to make that success sustainable. Anthopoulos spent more than a decade in Toronto’s front office. He first worked as the team’s scouting director and then as assistant GM. In 2009, he took over as GM after J.P. Ricciardi was fired. Despite decent records during his first few years as GM, the Blue Jays struggled to climb to the top of the AL East until 2015 when they won the division and went on to play in the ALCS. However, Anthopoulos did not stick around to see the Blue Jays reach the ALCS for a second straight year in 2016 with the team he had put together. After winning Sporting News Executive of the Year in 2015, Anthopoulos turned down a five-year contract offer and left the organization. It’s believed that Anthopoulos feared he would lose some of his decision-making power with Mark Shapiro taking over as Toronto’s president and CEO. Fortunately for Anthopoulos, that may not be an issue in Atlanta. It’s unclear if current Braves president John Hart will survive MLB’s investigation with his job. At the moment, there doesn’t appear to be evidence linking Hart to any wrongdoing. But since Coppolella’s infractions occurred under Hart’s watch, recent reports suggest that Hart may be removed from his job once Anthopoulos takes over as GM. It’s possible Hart may remain with the organization as a consultant. Meanwhile, Anthopoulos will have final say in the front office on all baseball matters. As Anthopoulos takes over as Braves GM, there is still a cloud of uncertainty hanging over his head. MLB appears to be a few weeks away from concluding its investigation and announcing any penalties. But the offseason is upon us and the Braves need a GM. Anthopoulos may not have been the team’s first choice. But with his track record, the Braves appear to be in good hands.